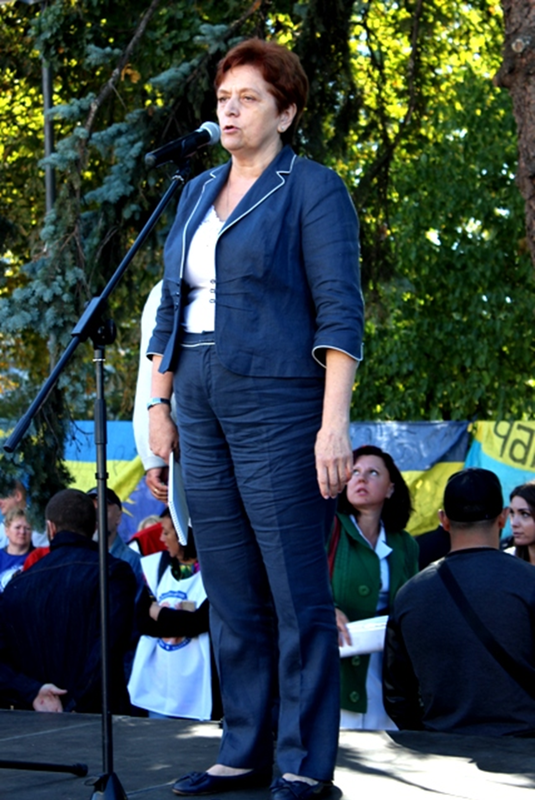 On 19 September, healthcare workers organised a mass protest in Kyiv in which more than 1,500 people took part. Among their basic demands are the increase in healthcare subvention of almost 4 billion UAH, higher wages and payment of arrears, and reform of the healthcare system in compliance with the Constitution and legislation. The trade unions also want their voice to be heard. “This peaceful action is just a warning, to see if we are heard. And then, based on the results, we will take a decision,” said the President of the Health Workers’ Union of Ukraine (HWUU) Viktoriia Koval. “If we are not heard, we will take more action,” she added. Ukrainian parliamentarian Oleg Musii specified that the wage arrears due to healthcare workers were 100 million UAH (3.8 million USD). “If today the healthcare workers are not heard, tomorrow all these people will quit their jobs,” said the Deputy of the Rada. The healthcare workers demand an increase in government financing of the healthcare sector to 7% of GDP. According to Koval, today only about 3% of GDP is allocated to healthcare in Ukraine. The organisers stated their demands to the Cabinet of Ministers, the Verkhovna Rada and the Presidential Administration. The action was organised by the HWUU. The protesters held union banners with the inscriptions: ‘Do not save on health’, ‘Decent wages for healthcare workers’, ‘Do not block oxygen to Ukrainian healthcare, ‘No to destruction of Ukrainian healthcare’. Earlier, the Rada adopted in the first reading the draft law on healthcare reform in Ukraine. According to protesters, the draft law is aimed not at reforming the sector, but at healthcare workers and hospital cuts. The forthcoming healthcare system reform caused a negative reaction in Ukraine society and among the Ukrainian healthcare workers. It became the topic of discussion at the sessions of the HWUU Presidium. 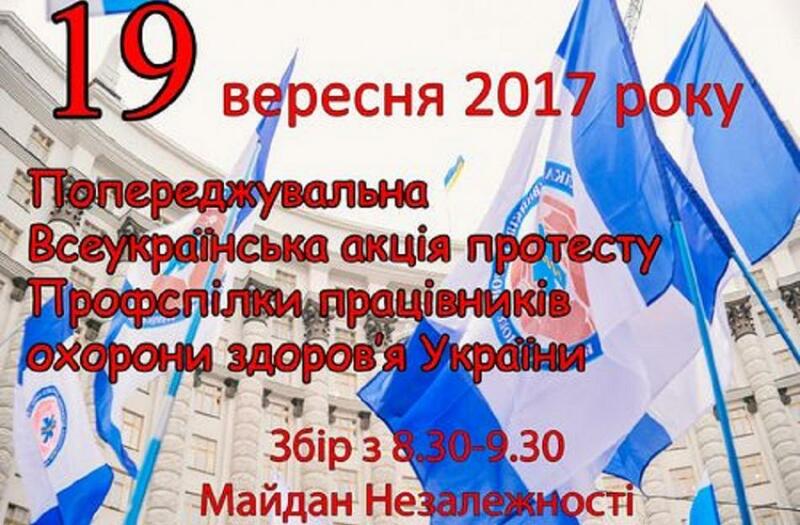 (18 September 2017) EPSU has sent a message of support to the Health Workers’ Union of the Ukraine for its major national demonstration tomorrow (19th September) that has the backing of many other Ukrainian trade union organisations. The protest is the latest stage of the HWUU’s campaign to resolve a labour dispute with the government and to achieve changes in planned health reforms. The union registered its labour dispute last year over unpaid wages, a claim for increased pay and for proper application of the pay system. The demonstration is also about funding a well-staffed, quality health system for all citizens in contrast to government plans based on private social insurance. The HWUU argues that the proposals run counter to the Ukrainian constitution and legislation and the government should revise its plans and take account of the position of the union and the healthcare community. The solidarity message with further details of the HWUU’s demands can be read here. These and a number of other issues were already raised and requested at the Health Care Reform Seminar in the Ukraine organised on 15 and 16 May 2017 in Kyiv in which EPSU participated. Next Why leftists can’t support Novorossia?